La Joya choker is inspired by a special kind of Poporo from the Pre-Columbian era. Today, the indigenous people still use the Poporo as a device to storage small amounts of lime. It’s constituted out of two pieces: the receptacle and the lid. The lid includes a pin that is used to carry the lime to the mouth while chewing coca leaves. Since the chewing of coca is sacred for the indigenous people, the Poporos are also attributed with mystical powers and social status. The Poporo is made out of calabash gourd. However, in the Pre-Columbian era the indigenous people used to make it in gold. 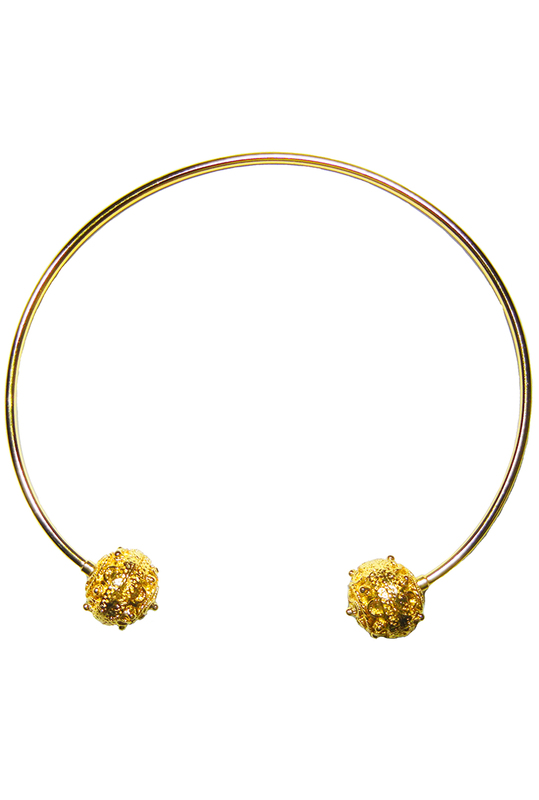 The beautiful hand-made 24k gold plated La Joya choker represents an ancient history with a contemporary edge. Extravaganza Deluxe! Product code: FA-CI-22 Categories: Suggestions, Under 300, Chokers. The metals used are Gold, Rhodium and Cobalt plated brass and 316L Stainless Steel. La Joya ring is inspired by a special kind of Poporo from the Pre-Columbian era. Today, the indigenous people still use the Poporo as a device to storage small amounts of lime. It’s constituted out of two pieces: the receptacle and the lid. The lid includes a pin that is used to carry the lime to the mouth while chewing coca leaves. Since the chewing of coca is sacred for the indigenous people, the Poporos are also attributed with mystical powers and social status. The Poporo is made out of calabash gourd. However, in the Pre-Columbian era the indigenous people used to make it in gold. The beautiful hand-made 24k gold plated La Joya ring represents an ancient history with a contemporary edge. Extravaganza Deluxe! La Joya River earrings are inspired by a special kind of Poporo from the Pre-Columbian era. Today, the indigenous people still use the Poporo as a device to storage small amounts of lime. It’s constituted out of two pieces: the receptacle and the lid. The lid includes a pin that is used to carry the lime to the mouth while chewing coca leaves. Since the chewing of coca is sacred for the indigenous people, the Poporos are also attributed with mystical powers and social status. The Poporo is made out of calabash gourd. However, in the Pre-Columbian era the indigenous people used to make it in gold. The beautiful hand-made 24k gold plated La Joya River earrings represents an ancient history with a contemporary edge. Extravaganza Deluxe! The Calamari earrings are inspired by the Pre-Columbian golden artwork attributed to the Kalamari tribes originated from the area that is now called Cartagena. The Pre-Columbian era is the period before Columbus discovered the Americas. These beautiful hand-made 24K gold plated Calamari earrings represents an ancient history with a contemporary edge. Extravaganza Deluxe! The Pandora earrings are a tribute to the shape of a woman. In Greek mythology Pandora was the first human woman created by the gods, it represents a gift to humanity. These beautiful hand-made 24k gold plated Pandora earrings represents an ancient history with a contemporary edge. Extravaganza Deluxe! The 24k gold plated Eyeball earrings are inspired by the mysterious powers of the "Third Eye". According to the indigenous tradition the Third Eye gives you the ability to see beyond ordinary sight. It symbolises spiritual insight and provides you with a vision of your inner soul or higher self, your true eternal being. These beautiful hand-made Eyeball earrings represents an ancient history with a contemporary edge. Extravaganza Deluxe! The Del Sol earrings are a tribute to the Sun. For indigenous people the sun was of great importance and a central object in their culture and religion. They revered the sun as the provider of light, heat, the facilitator of crops and the symbol of growth. Apart from its immediate connection to light and warmth, the sun was also important in timekeeping as the main indicator of the day and year. These beautiful hand-made 24k gold plated Del Sol earrings represents an ancient history with a contemporary edge. Extravaganza Deluxe!